and a brown dress coat. That physical description of Pierre, in stark contrast to the longer, leaner image I hold in my head of Paul Dano initially threw me off. While I’m trying to divorce the actors from my mind as I read War and Peace, it’s not easy. And while Lily James fits the part of the impassioned Natasha—except for her hair and eye color—and James Norton is the handsome brooding prince, Paul Dano doesn’t encompass the kind of big, socially clumsy, bear of a man Pierre represents to my way of thinking. 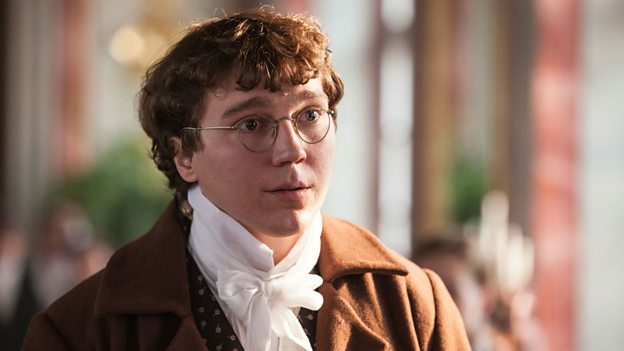 Although it’s clear from the BBC image, Dano gained weight and softened up for the role, beginning to look as I imagine Pierre. According to the Guardian, the physical aspect is one of the ways of approaching a role that Dano most relishes. 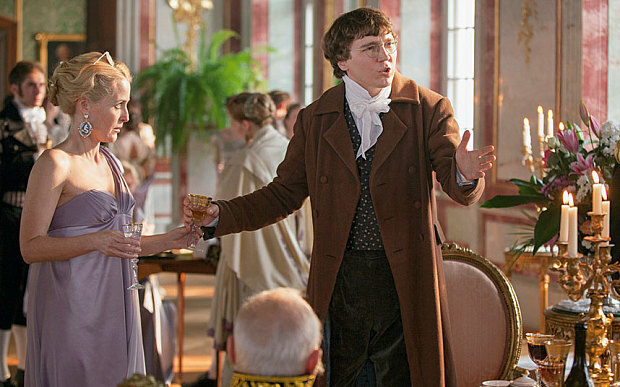 Dano, who read the classic novel prior to accepting the part, knows Pierre is “meant to be a bigger person than I am.” Smartly, the actor ‘thought long about what type of gaucheness he was trying to embody. That openness is what frightens Anna Pavlovna (Gillian Anderson) about him! Who knows what impolitically correct thing he may say next? For more on the enigmatic Paul Dano, check out The Guardian’s full article.